Jabari Brown joined the Missouri Tigers as a mid-season transfer last year, leaving the University of Oregon after starting two games in 2010-11. He enters this season as a redshirt junior and will attempt to replicate the success he found in a partial season with Missouri over a year. In 25 games last season, Brown averaged 13.7 points per game, shooting 46% on two pointers and 36.6% on three pointers in 32 minutes per game. The 6'5, 215 pound Brown has nice size for a shooting guard and decent speed, especially when moving laterally in the half-court. Brown was almost exclusively a jump shooter last season, as 84.4% of his shots were categorized as jump shots by Synergy Sports. He was a solid shooter in catch and shoot situations, where he made 38% of shots, averaging 1.13 points per possession, according to Synergy Sports. He has a great shooting motion and elevates well to shoot over taller defenders. Brown is not much of an offensive creator for Missouri last season, rarely getting to the basket in the half-court and seeing most of his looks coming in catch and shoot situations, only attempting 31 total off the dribble jumpers last season. He often struggled to square himself to the rim in pull-up situations effectively, which caused many of his attempts to come while off-balance. He was also unable to create offense for his teammates, as his 1.6 assists per 40 minutes pace adjusted ranked as one of the lowest among shooting guards in our database. Around the rim, Brown was largely untested, as he attempted only a handful of shots inside the paint last season. He was a below average finisher in this small sample, shooting 46%, as he does not possess the size or explosiveness needed to finish at a high rate in traffic. He doesn't shy away from contact, as his 5.0 free throw attempts per 40 minutes pace adjusted is solid for a player who plays off the ball most of the game, but he has yet to show the ball-handling ability and creativity you'd hope to see from a NBA shooting guard prospect. Defensively, Brown is a tireless worker and his physical tools make him a strong defensive player. He has above average agility and lateral movement to stay in front of quick players and enough strength at this point to hold off bigger players. On the ball, he moves his feet exceptionally well to not allow dribble penetration to beat him. He is just as impressive off the ball, constantly moving to cut off the offense while using his quickness to close out on shooters. Scouts will appreciate that he can add value to a team on the defensive side of the ball on those nights when his shot is not falling, even if his lack of size is somewhat concerning at his position at just 6-3 in shoes. This season, scouts will want to see Brown provide something other on offense than simply catching and shooting. With the loss of several high usage players, including Phil Pressey, Brown should have the opportunity to play with the ball in his hands more, showing whether he can create offense off the dribble or not. As he steps into a larger offensive role, he'll need to show the same commitment level on defense he did when he had to expend less energy on offense last season. 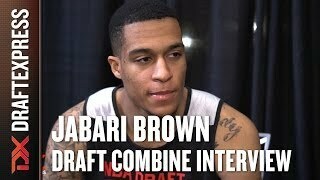 As it stands now, Brown's shooting alone is not enough for him to be a NBA draft prospect. Brown showed the potential to do more than that at the high school level, so if he adds a few wrinkles to his offensive game this season, he could begin to make more of a case for himself.